Split This Rock's Program and Administrative Associate Tiana Trutna recently interviewed Sheila Black, judge for the 2017 Split This Rock Annual Poetry Contest. In the exchange, the two cover topics such as disability, intersectionality, what Sheila looks for in a poem, and joy. We invite you to get to know Sheila Black and be sure to send in your poems for the Annual Poetry Contest by November 1. Sheila Black is the author of House of Bone, Love/Iraq (both CW Press), Wen Kroy (Dream Horse Press), and Iron, Ardent, forthcoming from Educe Press in 2017. 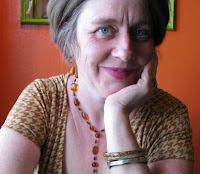 She is a co-editor with Jennifer Bartlett and Michael Northen of Beauty is a Verb: The New Poetry of Disability (Cinco Puntos Press), named a 2012 Notable Book for Adults by the American Library Association. A 2012 Witter Bynner Fellow, selected by Philip Levine, she lives in San Antonio, Texas where she directs Gemini Ink, a literary arts center. You co-edited the phenomenal Beauty is a Verb, The New Poetry of Disability with Jennifer Bartlett and Michael Northen. What surprised you the most about this anthology’s impact? I think what surprised me most was the fact that BIAV (Beauty is a Verb, The New Poetry of Disability) even came into existence and then that it was noticed. I should explain—at the time Jen and I and Mike began this, we had nothing more than a glimmer of an idea behind us. None of us had jobs in academia or many publishing contacts at that point. I had just left the university where I’d been an adjunct and then a contract instructor for many years, and had no job, and no clear sense of job direction. Jen was trying to eke out a living as a poet and adjunct instructor, and Mike had just retired from his work as educational coordinator for Inglis House, a facility that serves people with disabilities in Philadelphia. In a way, our lack of sustained employment was good, because we devoted ourselves entirely and wholeheartedly to putting together Beauty is a Verb. But to be honest I think we had very modest expectations of what would become of it. We imagined years of sending the book to small presses—some sort of small quiet publication—and just the satisfaction we’d done good work. What actually happened was a little more miraculous. On New Year’s Eve, when we’d been working on the project for about nine months, I went to a New Year’s Eve Party and happened to be seated next to Bobby Byrd, poet and publisher of Cinco Puntos Press. He asked me what I’d been up to. I told him—and I must have sounded excited, because he asked to see the manuscript. I sent it to him New Year’s Day. Two days later he called me and said Cinco Puntos wanted to publish it. I suppose I am telling this story for all the writers and thinkers out there with a project like ours in their minds—a project born out of sheer faith, love. An amateur project, if you will. I think BIAV taught me anyway that if you really go with what you believe, and you do your very best to make the work strong, bigger things can happen than you expect. What makes you proud about the book’s accomplishments? I am proud that Beauty is a Verb helped move non-disability communities away from a purely tragic conception of disability, or disability as simply a condition of being “less than.” I’m glad we were able to trace through the wonderful writers who contributed some of ways in which disability is a socially constructed phenomenon and how that construction occurs. And—I have to add—it still shocks me how dominant the idea of being “less than”: is—not only for people with disabilities, but for communities of color, communities of immigrants, LGTBQIA communities. We know it is wrong, but even so that idea persists and gets reproduced. I’m proud that BIAV is one of the many books of poetry, cultural artifacts we are seeing now that are exposing that idea for the fraudulent construct it is. You’ve said in past interviews that while editing the anthology, Beauty is a Verb, The New Poetry of Disability your ideas about disability expanded. Could you share a bit about that? By expanded my ideas of disability I think I meant I did not fully appreciate the creative aspects of most disability experiences—by that I mean the multiple ways in which alternative embodiment or what is often called “disordered thinking” often lead to experiences and insights that simply wouldn’t be available otherwise. To give some specifics—the way Larry Eigner describes space from the perspective of one who does not move freely within it; what ASL brings to the language of a poet like John Lee Clark—a kind of filmic quality or way of charting action; or how C.S. Giscombe conceives of transportation systems or “settling land” in a completely unique way that arises both out of his experience as an African-American man and a person with a disability; what Norma Coles’ work post-stroke tell us about the relationship between the word and what lies before the word. I became more appreciative of everyone’s—and I really do mean everyone’s—possession of a unique set of experiential information that can add to the body of all our knowledge; I think empathy, when it is really empathy, is less sympathy or pity than a bare recognition of that fact—realizing that expanded my sense of value and made me question the hierarchies, I had always lived within, which in most cases were historically established. What was it Elizabeth Bishop said in “To the Fishouses?”—“our knowledge is historical, flowing and flown.” When I was editing Beauty is a Verb I thought a lot about history—both as resource and burden. You’re helping to launch a new literary organization for poets with disabilities called Zoeglassia. Can you tell us more about the organization and its aspirations? Zoeglossia is an idea still, but soon to be implemented. I am very excited about it. The founders, Jennifer Bartlett, Connie Voisine and I were very indebted to forbearers like Canto Mundo, Kundiman, Cave Canem, and Lambda Literary—organizations that pioneered the idea of creating open spaces and supportive communities for African American, Asian-American, Latino, and LGTB poets. We were talking about these organizations, and how important they had been, and started to think that writers with disabilities really needed a similar space. In fact, this need seemed particularly urgent to us because people with disabilities are often isolated—in pure economic terms they also often don’t have significant resources to travel, to engage in mainstream writers conferences, educational opportunities, etc. The goal of Zoeglossia is to create an annual retreat that would involve professional development of attendees by prominent, established writers with disabilities. This would include writing workshops, lectures, panel discussions and literary readings. The emerging writers will be selected competitively based on their writing and their expenses at the retreat will be covered in order to facilitate participation. Writers will attend the retreat three times over a five-year period to attain the credential of “fellow.” While people with disabilities are among the largest minority group in America, writers with disabilities are vastly underrepresented in academia in general, and specifically in publishing, creative writing programs and the organizations that govern the field. We look to Zoeglossia to be an advocate for more representation of people with disabilities, but also a space for nurturing writers with disabilities to produce their own best works—a shared creative community with all that this implies. With Vilissa Thompson starting the #DisabilityTooWhite conversation on Twitter, there’s been some critique lately about disability being portrayed as overwhelmingly white in the media and disability community. How do you negotiate your whiteness as a disabled person and what are your thoughts on intersectionality? Vilissa Thompson is telling an important truth. I am not on Twitter—I am such a technology Luddite—so I missed this when it first happened, but she is so right. The media does portray disability as overwhelmingly white. It is also true that within disability communities we have a long way to go in terms of being fully multi-cultural in our organizations and movements. The sad irony is that this is exactly not the experience of disability itself. One of the powers of disability—if I can use such a word—is the way it cuts across differences of race, class, and nation. I was stopped a little by the second part of this question…I tried to figure out why I was having a hard time answering, and I realized it was the word “negotiate,” which I perhaps wrongly tend to associate with business dealings or work conflicts. I don’t know that my whiteness is negotiable. What I mean by that is that it is the weight of history…To be white in this country is to have a history of enforced privilege—to have been part of a story that is terrible and raw and involves genocide, and slavery, and colonization, and a pattern of oppression that has not yet ended. I may long to disavow that personally, but I really can’t, and I think—if I could be so bold—that to “negotiate” it feels wrong to me. I am not sure what to do about it, but it feels more like something I just have to sit with, live with, mourn and try to address—but not in a way that is controlling, because control, or the control implied for me by a word like negotiation, feels all wrong for the scale of the thing. That historical weight feels rather like something I should hold in the darkest silence of myself, try to breathe through, and try to really contemplate hard. I guess I am trying to say my personal negotiation feels a lot less important to me than being vulnerable to it. Intersectionality seems to me the way we have to move to move forward, particularly as the tools, especially the psychological modes of oppression, often function in remarkably similar ways—no matter what group they are used against…I hope that the movement toward greater justice for people with disabilities, people of color, LGTB people leads to a different sense of social order, a different way to understand and value our communities. A movement, in other words, that creates an order that is not quite so much like our current one, which is a little more like a pyramid scheme than I would like—a few lucky souls at the top and everyone else struggling to rise. I don’t think it has to be that way, but the alternatives are not easily arrived at. I think intersectionality, if considered as a dialogue between, could be a real space for forging something new. I try to push that in my work as an activist. In my writing, to be honest, I hold myself much more tightly—I think the real work I do is simply to try to tell the truth of my consciousness in as openhearted, vulnerable and ruthless way I can. A successful poet in your own right, can you tell us more about your writing process? Zadie Smith, who—as well as being a wonderful novelist—writes for me are what are perhaps some of the best personal and critical essays of our times, said something about writing or being a writer that I loved. “Tell the truth through whichever veil comes to hand — but tell it. Resign yourself to the lifelong sadness that comes from never being satisfied.” That was from a list she made—a great list—of advice to writers. I think that is pretty much my writing process. I try to tell the truth. I resign myself to being disappointed, because of course to convey the truth you can’t simply tell it, you have to eke it out of yourself through all kinds of indirection and necessary discretion, tempered, I think, by a willingness to be ruthless, and mostly with yourself, which involves a lot of failure—moments when you don’t get it right or just aren’t up to the task. I still find the production of a poem mysterious. I draft quickly and write a lot of drafts very quickly, but I revise very slowly. I have friends who are the other way around, but whichever way you choose, I think you have to work hard in the end. I also read a lot because nothing inspires me to want to write more than someone else’s beautiful poem. Yet that only helps to some degree, because to be good—though you never entirely know if you are good—you have to be willing to listen and nurture that small stubborn self that knows something—what? That’s the hard part, pinning down that “what” that no one else knows. As Split This Rock’s 10th Annual Poetry Contest Judge, tell us what you look for in a poem. What I look for in a poem? I have no idea until I find it. I like to be surprised. I like writers who weigh words in their own unique way. I think the work of a poet happens in much the same way as pearls are said to be made—something irritates or upsets you, or you just don’t understand it, and you spend a long time playing words, language until you find a way to get at that thing, maybe in part by suppressing it or not directly stating it, or only expressing it, in a way that also transforms it into an experience that contains something ineffable, a sense of the mystery of being. I like works that reframe ideas or experiences for me in ways that make me reconsider or renter that experience. I like poets who are vulnerable and also in complete authority. I like to hear a voice, a particular voice in a poem. Maybe that’s what I like most of all, the sense of a voice speaking as if through me in a way I have never heard something spoken before. Outside of the world of poetry, what brings you joy? I like to cook. I read once that Hanif Kureishi (the author of “My Beautiful Laundrette”) complained in his divorce from his second or third wife that she read cookbooks in bed, and I thought, “But that’s me, I read cookbooks in bed!” Reading cookbooks in bed makes me happy. I like to go to movies alone in the middle of the afternoon. I like to hang out in the kitchen with my children. I like to go to museums and look at one painting for half an hour and then leave. I like to travel almost anywhere. I think most, if not all, of the happiest times of my life have been when I was on the road or in a motel or hotel room or a borrowed house in a city I didn’t know. All these things do give me joy—even if it is sometimes a slightly melancholic joy. What would you like to be known for and how would you like to be described? All things considered that is probably more than enough. workshop and readings in both DC and Virginia. Patrick Rosal is the author of four full-length poetry collections. His newest book, Brooklyn Antediluvian, was called by Publisher's Weekly "an earth-shattering performance." Patricia Smith says of the collection, "The poet's wide-aloud love song to New York's most boisterous borough is a deftly-crafted tour-de-force, a sleek melding of lyric and unflinching light." He also is the author of Boneshepherds, My American Kundiman, and Uprock Headspin Scramble and Dive. 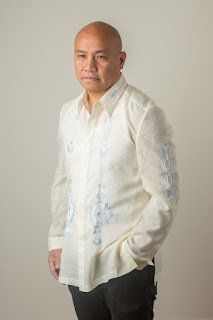 His collections have been honored with the Association of Asian American Studies Book Award, Global Filipino Literary Award and the Asian American Writers Workshop Members' Choice Award. Don't miss Patrick Rosal at this week-long regional festival for all ages! Read more about the event and the festival at the Fall for the Book website. In this workshop, participants will read poems for their argument-not intellectual or legal arguments exactly, but poetic arguments. What kinds of arguments can a poem make that litigation or ad copy can't? How does a poem make an argument in images? Can a poet make beauty of dissent, not just with "the world," but with "the self"? Workshop will include a combination of reading, discussion, and writing. Light refreshments will be served. All are welcomed! No experience necessary. Space is limited and scholarships available. Register online by September 29! Join us for poetry, community, and light refreshments as Patrick Rosal shares his work. Special guest Holly Bass, Poet & Multidisciplinary Artist! Learn more on the Facebook event page.